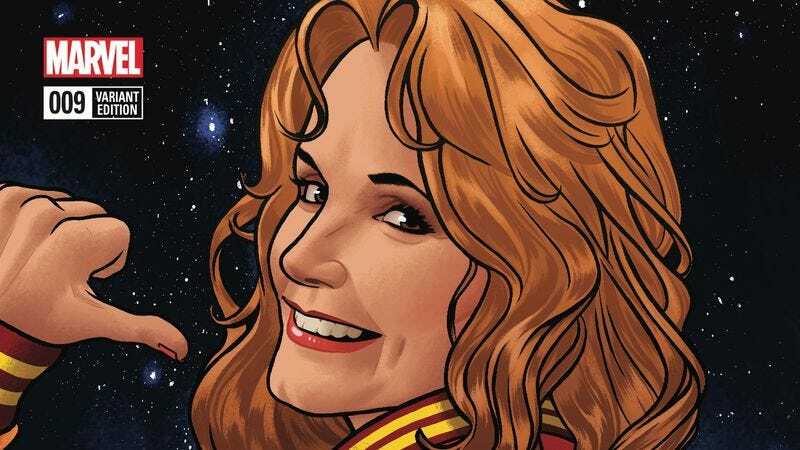 When it comes to superhero comic guest stars, it doesn’t get much weirder than Lea Thompson showing up in Howard The Duck. Thompson starred in the infamous box office bomb based on Steve Gerber’s original Howard The Duck series, and now she needs Howard’s help in the comics to figure out what she’s been doing during prolonged blackout periods. All she knows is that she’s been having dreams of New York City and a duck man, so naturally she’d go to New York City’s most prominent anthropomorphic duck detective for assistance with her case. Last month’s Howard The Duck #8 saw the series reaching new heights of emotional storytelling with the return of Howard’s old best friend Beverly Switzler, but this preview of next week’s issue #9 returns to the wacky high jinks that have defined much of writer Chip Zdarsky and artist Joe Quinones’ run on the title. That sense of humor is a big reason why the title is so engaging, and these pages are full of jokes and visual gags as Aunt May swoons over Thompson (who happens to be the aunt of Eugene “Flash” Thompson, the Marvel Universe’s current Venom) and Johnny Storm cameos to give Tara a new costume. Howard The Duck is coming to an end in September, and while it will be sad to see it go, fans should take joy in the fact that this creative team was able to create such a strange, entertaining take on one of Marvel’s most unconventional characters.